Mainly sunny. High 83F. Winds WNW at 10 to 15 mph..
Clear. Low 59F. Winds ENE at 5 to 10 mph. A Nazi flag hangs in the corner of history teacher David Gaeta's classroom at Frontier High School. We live in the age of apology. We're sorry we misspoke, we're sorry we were insensitive, we're sorry we had the audacity to once have been less enlightened. Sometimes apologies are absolutely warranted and occasionally even sincere, but oftentimes they reek of expedience, correctness or strategic course adjustment. 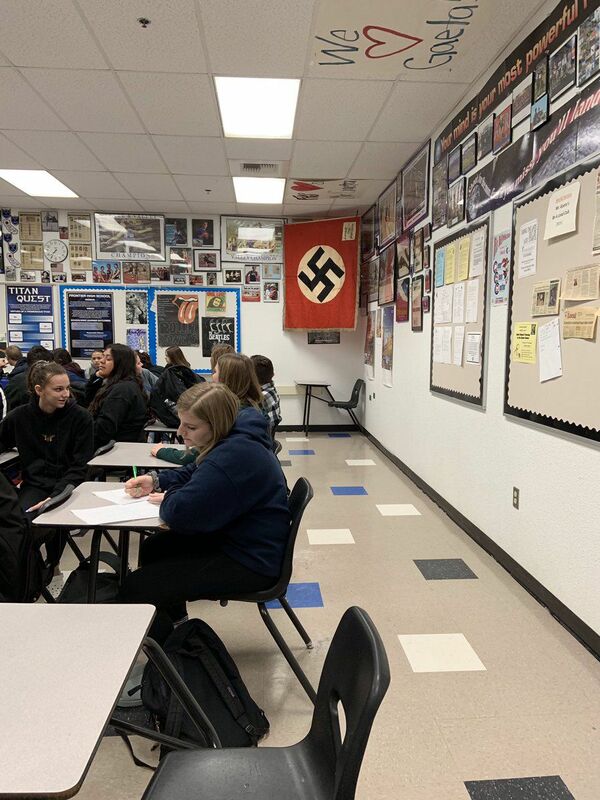 So it's refreshing to not have been apologized to over the latest local controversy: The Nazi flag that hung on a classroom wall for a day at west Bakersfield's Frontier High School last month. After a parent complained — respectfully, citing students' general admiration for Frontier history teacher David Gaeta — Gaeta and school administrators agreed that the flag should come down. Their decision was understandable. In any setting, under any circumstances, the public display of a Nazi flag is offensive and unacceptable. With one exception: the circumstances of this particular case, and cases like it. Gaeta, a 20-year-veteran teacher, was starting a three-week unit on World War II, the 20th century's defining battle of good and evil. Teaching high school students about that spasm of history requires an understanding of Nazi Germany — how it came to be, what its leaders hoped to accomplish and how they went about fulfilling that quest. A lesson plan like that demands visuals — a map of Europe and the Pacific Theater, the warships, the warplanes, the field artillery, the troop movements, the uniformed fighters themselves, the civilian victims and of course the flags. Some of those visuals can be adequately conveyed in a book or a film, but the Nazi flag is not one of them. "Each year," Gabriel Gaeta, the teacher's son, said of his father, "he notifies administration and takes the time to thoroughly and diligently explain the flag’s origin and history to students." Mr. Gaeta's red, white and black banner, a real World War II-era flag a student had given him, passed along from a relative who had served, had the power of tactile authenticity. Every Monday through Friday during that unit of instruction, students would have walked into a classroom haunted by the same iconic presence that haunted Germany and all of Western Europe for a generation. Words and pictures cannot meaningfully deliver that atmosphere of foreboding. A flag can at least come close. No apology is required for having attempted to take students to that place. Parent Roxie Hartline, in a text message to The Californian, correctly noted that the Nazi flag is still with us, having been adopted by modern-day racists. And her daughter is African-American. Nazi Germany, like the racists who lurk in and increasingly out of the shadows in America today, was not a place of comfort for anyone other than Hitler's anointed demographic: Northern European Protestant heterosexuals. All others had reason to fear. That means all of the black, brown, Sikh, Asian, Jewish, Catholic, Muslim and LGBT students in that classroom should have been able to develop an empathy that much better attuned to the people who lived that fear 70, 80 years ago. Empathy is a doorway to understanding and understanding a barrier to regression. If Mr. Gaeta is the teacher everyone says he is, he understands that quite well. If Mr. Gaeta is the teacher everyone says he is, and I'm certain he is, he also sees a lesson in this controversy that is every bit as powerful as the one he intended: Images can have a power that time and instruments of surrender do not diminish. Contact Robert Price at 661-395-7399, rprice@bakersfield.com or on Twitter: @stubblebuzz. FYI, Judaism is not a race, though many people may believe it is. It is a religion. It does not change what they have suffered but Jews certainly deserve to have their religion recognizes as such. While I'm frequently (and incorrectly) labeled a liberal, I must agree with Mr. Price. Ignoring history is inviting history to repeat itself. Regardless of your race, religion of political choice, learning history is absolutely essential to taking part in the life we live. This is a history class, not a Nazi demonstration. Our children and grandchildren are already insulated from the lives of even MY parents. As a result, they live isolated lives, ignorant of the dangers lurking just around the corner. Being aware of the way movements arise and how far they may progress is part of being forewarned. You are all missing the point thatbsaid flag is a representation of current racism , not just ww2 nazism. Was this taught as well? Doubtful . Since when is apologizing for being insensitive to others race or culture a bad thing?Example of Toxic masculinity Mr Price. Real men apologize . Little boys do not. Censorship is alive and well at the Bakersfield Californian. The BC removed my comments critical of Mr. Price. The Nazis thank you for your support. It's 2019, Mr. Price. How dare you ignore the fact that your president and your local congressman aren't enjoying the support of a surging Nazi movement. Yet again liberals like Mr. Price prove that they are the best damned apologists for Nazism that money can buy. Context matters. Right now, in 2019, we have a president who enjoys the support of open Nazis and a congressional representative who shares an ideology with Nazis. Students bring Nazi flags to my old high school, North High. Stores in Oildale sell Nazi memorabilia. This is the context in which this teacher dared to fly this flag. If her job is EDUCATOR, she failed miserably. And for a "journalist" to fail to include the context in which this damned flag is flown is despicable. Excellent article. Multiple Nazi flags and other racist iconography are displayed at the Museum of Tolerance in Los Angeles. Is the museum racist for doing so? Of course not. Learning about these dark periods of human history requires open discussion and presentation. People fully against the Nazi regime had to endure seeing that flag on everything from state buildings to fireplace mantles during WWII. That experience isn't something that can simply be conveyed in words. I've recently had a short discussion with my family and a few friends encouraging them all to read our local paper daily. This, not only to be in the know on the happenings in our neighborhoods, but for great reads like this one. Excellent take on this by Mr Price. Also, probably handled correctly by the teacher, though I'd have been tempted to argue the point that the flag likely sparked an interest and curiosity that pulled the students into the lesson. I know it would have for my son. "What the heck? a Nazi flag? Where is this guy going with this?!?" Instantly tuned in. "Not to worry . . . reminders of evil are as important as reminders of good." Semper Fortis . . . ! Sadly, this parent and her child have made future pupils of history thier victim. To compare murdering almost an entire race is nowhere equalivent to what her perceived values of some in America. The parent should visit the intellectuals of the repressed. Second that . . . ! Excellent treatment of this issue, Bob!